Japan's social media has gone into nervous overdrive following the discovery of a number of deep-sea fish traditionally thought to be harbingers of natural disaster. On Monday, an oarfish measuring nearly four metres from snout to tail was found tangled in a fishing net off the port of Imizu, in the north-coast prefecture of Toyama. The fish was already dead but was later taken to the nearby Uozu Aquarium to be studied. Two more of the slender, snake-like fish were discovered in Toyama Bay nine days earlier. A record four oarfish were found in Toyama Bay in 2015 but that could be surpassed this year. The species - characterised by long silver bodies and red fins - usually inhabit deep waters and the fish are rarely seen from the surface, although legend has it that when oarfish rise to shallow waters, disaster is near. Even the species' traditional Japanese name, ryugu no tukai - which translates as "messenger from the palace of the dragon king" - hints at its links to natural disasters in the past. According to lore, the fish rise to the surface and beach themselves ahead of an impending earthquake. That ties in with scientific theories that bottom-dwelling fish may very well be susceptible to movements in seismic fault lines and act in uncharacteristic ways before an earthquake. 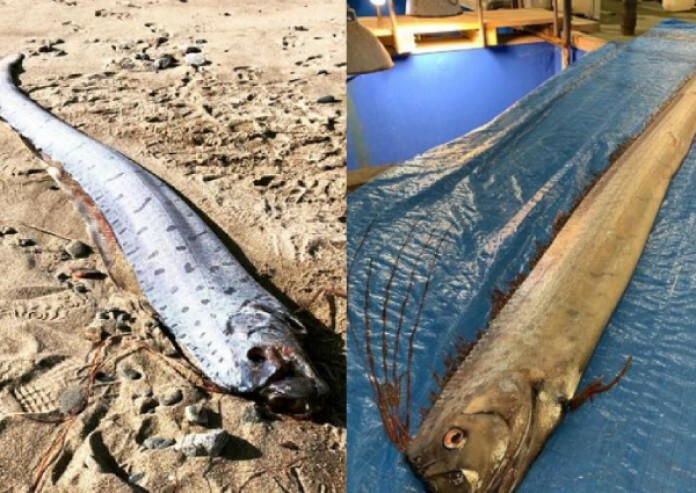 Hiroyuki Motomura, a professor of ichthyology at Kagoshima University, has a more mundane explanation for the recent discovery of oarfish off Toyama Prefecture. "I have around 20 specimens of this fish in my collection so it's not a very rare species, but I believe these fish tend to rise to the surface when their physical condition is poor, rising on water currents, which is why they are so often dead when they are found," he said. "The link to reports of seismic activity goes back many, many years, but there is no scientific evidence of a connection so I don't think people need to worry." Nevertheless, the oarfish's reputation as an indicator of imminent doom was enhanced after at least 10 oarfish were washed up along Japan's northern coastline in 2010. In March 2011, a magnitude-9 earthquake struck off northeast Japan, triggering a massive tsunami that killed nearly 19,000 people and destroyed the Fukushima nuclear plant. With that anniversary looming, people on social media became jittery about the omens. A message on Twitter claimed: "This is no doubt evidence of a precursor to an earthquake. And if it is in the Nankai Trough, it might be a huge quake." Experts warned a tremor in the Nankai Trough, which runs parallel to Japan's southern coast from off Nagoya to the southern island of Kyushu, could be imminent and resulting tsunami could cause massive loss of life and destruction in coastal areas. The most recent government predictions suggest a tsunami more than 30 metres high could be generated by a major quake. One Twitter user asked: "Is something happening deep in the sea?" Another questioned: "What is going on under Toyama Bay?" Comments on other social media sites echoed those concerns, with one post in the 5-Channel site claiming increased sightings were "a warning". Despite the concern, experts said it was not possible to scientifically link increased sightings of oarfish with an impending natural disaster. Professor Shigeo Aramaki, a seismologist at the University of Tokyo, dismissed the fears of social media users as "nothing". "I'm not a specialist in fish, but there is no academic literature that has proven a scientific link to the behaviour of animals and seismic activity," he said. "I see absolutely no reason for concern and I have seen no updated reports of increased seismic activity in this country in recent weeks." The Japanese government, however, announced a new package of response measures to a major earthquake beneath Tokyo, including additional steps to evacuate foreigners from the city. They also call for improved delivery of information on places to take shelter, evacuation routes and medical treatment. The information will be made available in more languages via disaster information websites.